Are you eating your fruits and veggies? In a recent informal poll by HealthInfi, 42 percent of respondents answered that question with a resounding no, reporting only consuming 0-2 servings a day. A close second (40 percent) say they consume 3-5 servings, which is still lower than the American Heart Association suggested amount, which calls for eight servings. The Dietary Guidelines from the U.S. Department of Agriculture (USDA) recommend anywhere from 5 to 13 servings of fruits and vegetables per day depending on age, gender, physical activity and overall health. 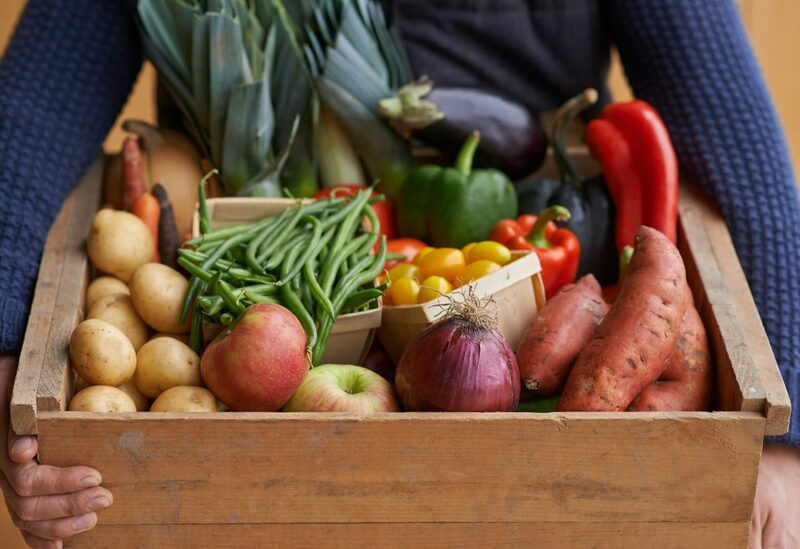 You’ve heard it before.Americans just aren’t getting enough fruits and vegetables. And as the foundation of a healthy diet, consider fruits and vegetables your fountain of youth. Rich in vitamins, nutrients, antioxidants, fiber, and water, it’s hard to understand how so many can resist that gorgeous nutritional profile. But the hard facts tell us that less than 30% of us that’s seven out of every ten Americans – are failing to meet the recommended 5 A Day. Enter in The 12 Healthy Habits. We’re not asking for a revolution. Just a few small and very simple changes to make you eat better, feel better, and create an overall new sense of well-being. Step one: Eat more Fruits & Veggies. Yes, we are actually asking you to eat more of something. How often do you get to hear that? Here are 12 simple ways to get you eating veggies and fruits today. The importance of eating breakfast is immeasurable. Not only does it break the fast and jumpstart your metabolism, but it also boosts your performance at work or school, helps with weight maintenance, and for the purposes of Healthy Habit , is the perfect time get in an extra fruit or vegetable serving for the day. Stir berries (fresh or frozen), dried fruit, or banana slices into yogurt, cereal, or oatmeal. Our Overnight Maple-Raisin Oatmeal (shown here) boasts a full serving of fruit plus the benefits of oats. Every 1/2 cup of fruit you add is a serving. Make a smoothie. Combine some low fat milk or yogurt, 1/2 cup frozen berries and a banana for a super easy blended breakfast – and 2 entire fruit servings. The average American eats just three servings of fruit and vegetables a day, according to the Harvard School of Public Health. Regardless of whether that includes you, the one thing almost everyone can do to improve their diet is to eat more vegetables. Why not? Veggies are filling, loaded with antioxidants and the source of most of the nutrients your body needs to thrive. They’re also delicious. If you struggle with eating enough vegetables or would like to sneak in more, here are 10 easy ways to make that happen, starting with your next trip to the supermarket. Instead of snacking on chips or cookies, make sure to have healthier alternatives on hand. Some great options include baby carrots and hummus, celery and peanut butter, sugar snap peas or a piece of fruit. Remember that a cup of most raw fruits or veggies equals one serving. Passing by the kitchen? You’re more likely to grab a handful of grapes or cherries if they are sitting on the counter displayed in a nice bowl. Or perhaps, if they’re in your view, you’ll grab a banana or orange on the way out the door. Homemade soups can be super simple and a great way to increase your vegetable intake. Cook any amount of fresh or leftover vegetables (for example, carrots, onions, green beans, mushrooms, rutabagas, tomatoes and zucchini) until vegetables are tender and add them to a simple broth for an easy weekday meal. Throw in a can of beans and some leftover cooked brown rice or quinoa for a heartier soup. If you find yourself with a free hour on a Sunday morning, get out the chopper and prepare your veggies for the week. Sautee some olive oil with peppers, mushrooms, onions and zucchini so the mix is ready to add to any meal omelets, salads, sandwiches, pasta and more. Make sure every meal or snack you eat is paired with a fruit or veggie. For instance, add salsa to your eggs, avocado to your turkey sandwich and fruit to your cereal or pair string cheese with a handful of grapes or celery with peanut butter, instead of crackers. Two serving of veggies please! This is the one time that doubling up on your servings can actually be a good thing. The USDA recommends filling half your plate with fruits and veggies. Always include salad before or after dinner. And this doesn’t have to mean just boring lettuce and tomato try spicing it up, maybe with saut mushrooms or by making a chopped salad with fruit and nuts. Looking for a sweet snack after dinner? Sometimes the perfect simple dessert consists of a handful of frozen grapes or strawberries (1/2 a cup equals one serving). A blended smoothie can offer the perfect breakfast, lunch or snack. Start with your favorite fruits and some low-fat or almond milk and then throw in a handful of greens for an added nutritional boost (1 cup of greens equals one serving of veggies). If you’re worried that you won’t like the flavor of the spinach or romaine, add a banana or a small spoonful of peanut butter or both, and you won’t taste the greens. Picky eaters won even notice a layer of spinach in the lasagna or a cup of sauted diced carrots in the tomato sauce. Making your own hummus? Blend in red peppers and avocado for added flavor and health benefits.